Instant e-vouchers and posted gift boxes now available for FREE. Each Paintballing voucher is separate and is valid for up to 8 players. Only £39.99! Valid for up to 8 players. – Up to 8 players! Buy a Paintballing Gift Voucher! You’ve found the ideal Paintballing birthday present or card filler – Check out GO Paintball London’s 8 Player VIP Paintballing vouchers. Run by the former UK#1 Paintball player, GO Paintball London is the premier Paintball venue for London, Surrey and Kent – providing our customers with the freshest, most exciting and immersive Paintballing experience possible! Paintballing Gift Idea – E-Vouchers & free experience gift boxes! On top of Instant e-vouchers, our posted Paintball Gift Boxes are now available for free! 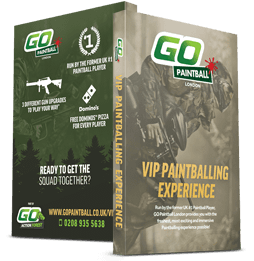 GO Paintball London’s VIP Paintballing vouchers allows a squad of up to 8 players their Full Day Admission and all Equipment hire – over 8 action packed games at London and Surrey’s premier Paintballing venue. Being a Paintballing hero can also build up quite an appetite, so they’ll also receive a FREE 9" Pizza Hut pizza lunch to keep them fuelled and in the game until home time! All the players will have to purchase for their day is their paintballs. Our VIP Paintballing vouchers are valid for a full 6 months for any public events (minimum age: 10). There’s also no need to have to pre-book an event date for the recipient; they can book it for a date that suits them – easy! Best man arranged a stag do with GO Paintball London. 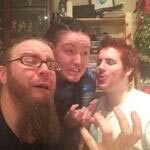 Best venue I have been to, staff are fun and know what they are doing. Great gun selections. Battle field lay outs and game objectives are really good. Great day out and well worth doing a stag party there. Thanks!